Alice is a rational-minded sleep doctor, haunted by the mysterious nocturnal death of her younger brother. Whilst performing a routine examination on a traumatised family with sleeping problems, Alice is attacked by the father in his sleep. 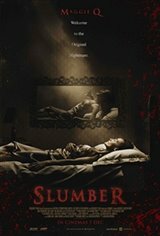 The father is arrested and blamed for causing the family's sleep issues, but when he is thrown into jail and the problems get progressively worse, Alice is forced to abandon scientific rationale and accept that the family is being terrorised by a parasitic demon who feeds on the weak whilst they sleep: the Night Hag. In order to defeat the dark spirit who was also responsible for her brother's death, Alice must journey into her own nightmares and confront her childhood demons.